Woke up at 4 AM to eat breakfast before we head up to the almighty Machu Picchu with our newly joined group,which consisted of Annie, me, the three California girls, one Irish couple and one Australian couple. All of them except for us, decided to climb up to Machu Picchu while we bus up. Annie and I needed to save our energy to hike up Huayna Picchu, the mountain that’s in the background of all the Machu Picchu pictures! 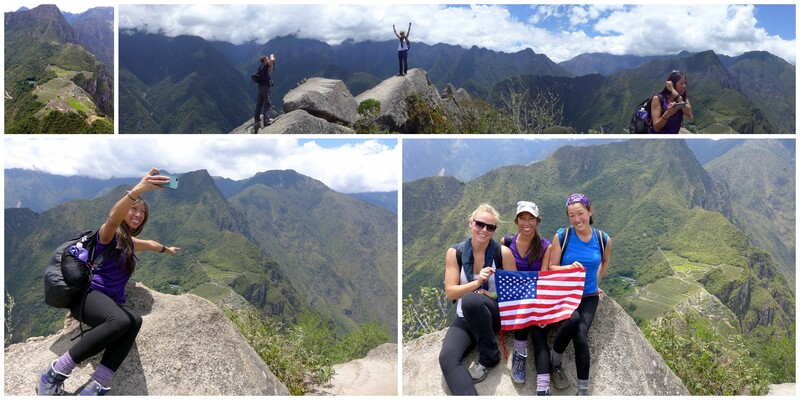 You must purchase tickets ahead of time to climb Huayna Picchu. Make sure you do that because it’s absolutely worth it, the view is fantastic and you will be 360 meters higher than Machu Picchu! Inca means ‘king’ or ‘ruler’. Around the mid 1500’s the Spaniards came and infiltrated the Inca empire. 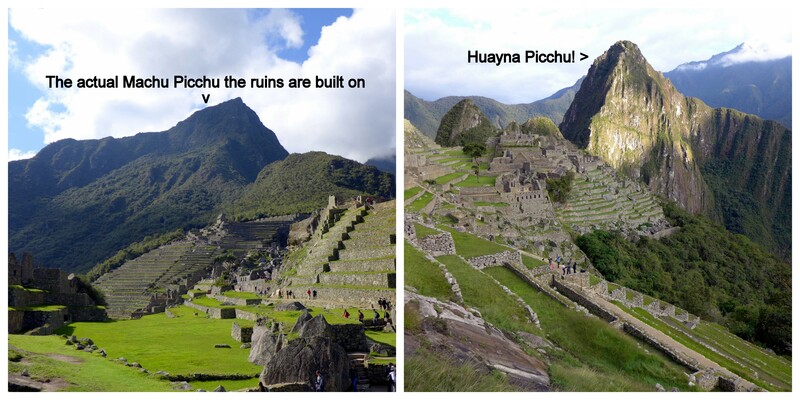 They destroyed all the known Inca sites, except for Machu Picchu. MP was known locally but the site was never revealed to the Spaniards. Based on the remains found in MP, which consisted mostly of females, researchers theorized that MP was a sanctuary and home to the Inca’s wives and wives of the nobles. In 1912 and 1914–15, Bingham excavated treasures from Machu Picchu and brought them back to Yale. To the Peruvians’ dismay, these treasures were never returned to MP. Sunrise over the Machu Picchu ruins. We learned a bit more about the different stone structures and techniques used for building rooms that served different purposes and the guide showed us a stone compass. We then had some free time to roam around before our allotted time to enter Huayna Picchu at 10 AM. Flag from our snowboarding instructor in Lima which Annie promised him that we would take a picture with on MP. A llama strolling about the ruins, keeping the grass trimmed. Huayna Picchu (Wayna Pikchu in Quechua, wayna = young man,pikchu = pyramid) is about 2,720 metres (8,920 ft) above sea level, or about 360 metres (1,180 ft) higher than Machu Picchu. 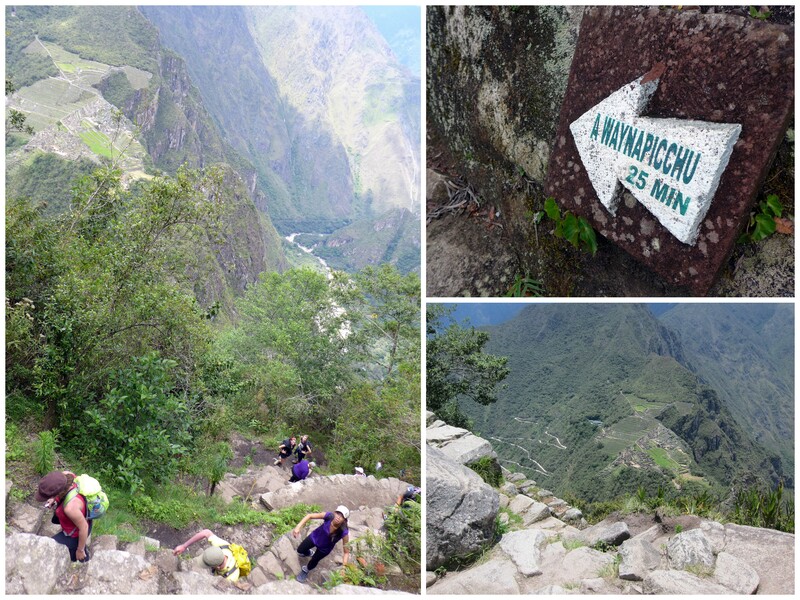 According to wiki, the Incas built a trail up the side of the Huayna Picchu and built temples and terraces on its top. The top of the mountain was the residence for the high priest and the local virgins. Every morning before sunrise, the high priest with a small group would walk to Machu Picchu to signal the coming of the new day. Entrance to Huayna Picchu. Photo courtesy of Annie. And me trying to pump myself up for the climb. The climb is supposed to take only one hour to reach the peak, based on the control board’s estimate. In Annie’s words, liiiiieeeeesss!!! At first the trail was up and down with a mix of dirt, wood, and stone steps. Then we got about a third of the way in and all of a sudden the trail extended into super large and high OR super narrow and small stone/rock steps. The large steps will need a good hop to get on and the small steps required a twist at the torso to side step unto the next. It’s an awkward game of twister + stair master + hopscotch. At the 25 minute mark, I felt like the end was near. More lies. That must be a sign for the priests and his fellow disciples. Towards the top where we can almost reach the peak, the steps were so small I had to use my hands too in order to balance. I can hear a couple of other Chinese ladies yell to each other, “don’t go up there, it’s too dangerous!” While my biggest concern was a gust of wind strong enough to push a person over the edge. There would be no remains. When the hardest part was over, we were immediately rewarded by a gorgeous panoramic view of the entire Machu Picchu and the ruins, along with the rivers winding through the valleys of nearby mountains. Talk about a million dollar view (for which will require a million dollar elevator)! Caught Annie on a selfy (not easy as she is quick!) And a peak-a-ruin moment with Erica. Can you see an eagle from the outline of the ruins? On the way down we saw a housing structure overlooking Machu Picchu. Who lived there and what was it for? Only the mountains know and they are great at keeping secrets. It is no small miracle that the Machu Picchu ruins survived the Spanish invasion. I was impressed and sadden by the history of the Incas. They managed to achieve intellectual advances, build large infrastructures and maintain social order without the use of currencies, only reciprocal exchange, a traditional form of mutual help. Is that not what our ‘modern’ societies are striving for? Best trekking face EVER! As Annie exits Huayna Picchu.